MapQuest has no shortage of cachet with the older folks, but I've taken Google Maps' last few years of ubiquity to mean that AOL's mapping service was dying off. Judging by this brand-new, cut-rate turn-turn-app, well, not quite. 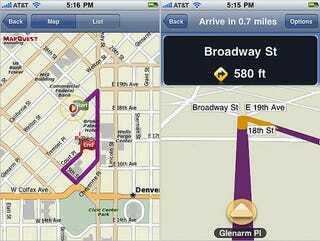 MapQuest Navigator is network-based, like the similarly-position MotionX GPS Drive, which brings a distinct set of advantages and disadvantages: The lack of a large local cache frees up space on your iPhone, and since it's stored on MapQuest's servers, the map and POI data your seeing is always up to date; that said, if you lose network coverage, well, you're boned.